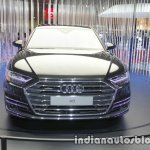 Audi is showcasing the 2018 Audi A8 and 2018 Audi A8 L at the 2017 Tokyo Motor Show. 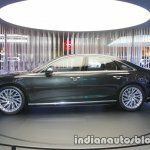 The new generation A8 range’s international launch will take place at the end of November 2017. 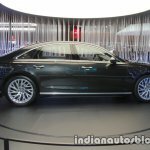 The 2018 Audi A8 is 5,172 mm (+37 mm) long, 1,945 mm wide (-4 mm) and 1,473 mm tall (+13 mm). It has a 2,998 mm (+ 6 mm) wheelbase. 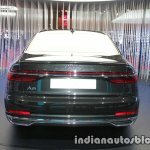 The 2018 Audi A8 L is 5,302 mm long (+37 mm), 1,945 mm wide (-4 mm) and 1,488 mm tall (+17 mm). It has a 3,128 mm wheelbase (+6 mm). 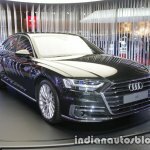 Low & wide is the latest industry trend, but Audi has gone opposite with all-new A8/A8 L.
The new generation A8 range starts with two V6 turbo engines: a 3.0 TFSI and a 3.0 TDI. The TFSI petrol engine produces 340 PS and 500 Nm of torque. The TDI diesel engine develops 286 PS and 600 Nm of torque. The 8-speed Tiptronic automatic transmission and the Quattro permanent AWD system are standard. 460 PS 4.0 TFSI V8 petrol, 585 PS 6.0 W12 petrol and 435 PS 4.0 V8 TDI engines will follow. 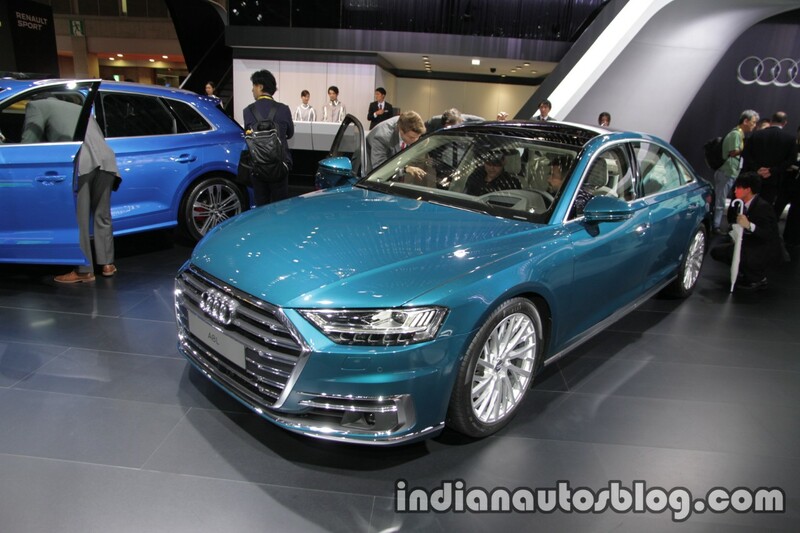 Also, Audi has confirmed an Audi A8 L e-tron Quattro, its third PHEV. The plug-in hybrid variant’s powertrain, consisting of a 3.0 TFSI engine and an electric motor, will offer 449 PS and 700 Nm of torque. It has a pure electric range of about 50 km. 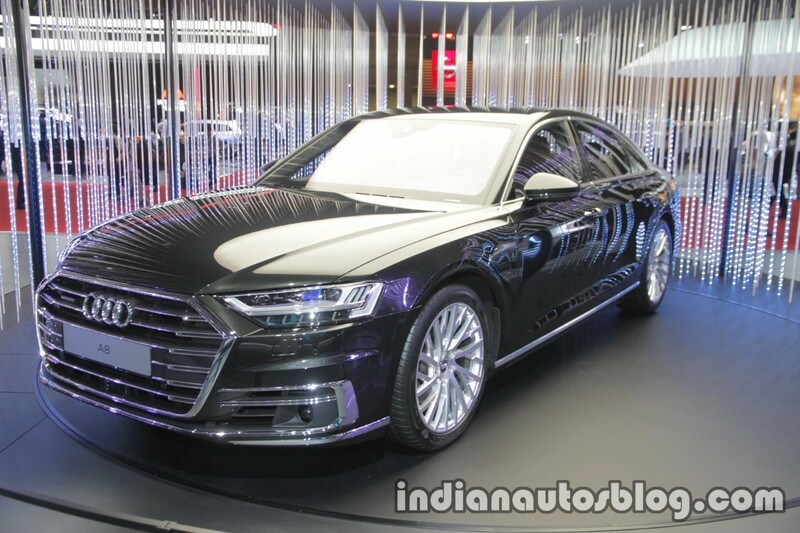 On the outside, the all-new Audi A8 features new hexagonal Singleframe grille, HD Matrix LED headlights including Audi laser light, 21-inch wheels and homogeneous-beam OLED rear lights. Interior highlights include 12.3-inch Audi virtual cockpit, dual central display setup with 10.1-inch infotainment system screen and 8.6-inch screen for AC and comfort controls and 1,920-watt, 23-speaker Bang & Olufsen Advanced Sound System with 3D Sound (in front and rear). The all-new Audi A8 is the world’s first production model to feature level 3 autonomous driving. Audi AI traffic jam pilot offers autonomous driving on highways and multi-lane motorways to curb stress in a traffic jam or slow-moving highway traffic up to 60 km/h. Audi AI (remote) parking pilot and Audi AI remote garage pilot offer automatic (parallel and perpendicular) parking. 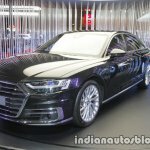 The 2018 Audi A8 and 2018 Audi A8 L will go on sale in Japan in 2018. Audi builds both models at the Neckarsulm plant in Germany.